Pulsating, Alive, On the move, Vibrant & Fun..these words very appropriately define my feelings for Mumbai. The city that never sleeps is a fascinating town with a compact mix of traditional & the modern. Visit to Mumbai was on my cards for long. Little did i know, that after my post grad, the city of dreams as known by everyone across the globe, would be the destination for onset of my professional odyssey. The fast-paced life here is crazy!! It really gives one a lifetime experience. This is in every way the city of dreams and the city of unflinching strength. I have grumbled about the city, rued the dearth of infrastructure & civic sense, complained about the fast deteriorating public transport system & the high cost of living & my escalating expenditures, yet I felt life, I felt love, and more than that I felt me in all the moments which made me smile for no reason. Yes, Mumbai holds a very special place in my memories and in my heart. The city is home to people from all walks of life where millionaires retire to their plush homes, the middle-class make their way to another day defined by the train timetable and the homeless find their sweet spot on the pavements. Trust, its a confluence of varied class, cultures & traditions. Mumbai is a bustling example of unity in diversity and not to miss out the phenomenal gastronomical adventures that this city has to offer to its residents and to those who happen to visit this hot-spot melting point. More than the big cities famous fine dining experiences, the various food capitals across the globe are known for there scrumptious street food. Similarly, Mumbai streets serve some of the most lip-smacking delicacies that are, in fact, preferred over those served in plush restaurants. The fast-moving life has given rise to hordes of "junk-food outlets" on almost every road, offering delectable choices of city's very own pav bhaji, bhel puri or the well-known Vada Pav, a road-side food, which is an omnipresent feature of urban India. 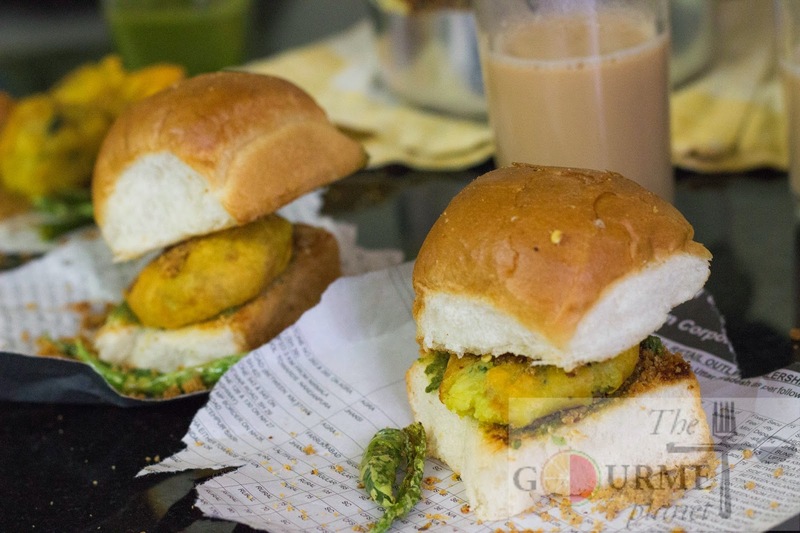 While today i had an urge to revisit the cherished memoirs of my stint in Mumbai, i decided to recreate the flavors of the much acclaimed Vada Pav with homemade 'cutting chai' in my kitchen. One bite and phewwww..!! You will be convinced why this dish is simply patronized by everyone from all the socio-economic levels. 1. Dry roast all the ingredients for garlic chutney separately in a pan. 2. Once the roasted ingredients have cooled down, blitz them in a blender. 3. The powder will be coarse & sticky in texture due to oil released from coconut and peanut. 4. Spread the powder on a sheet of paper, allowing the excessive oil to get removed. 5. Now blend all the ingredients mentioned for green chutney and squeeze in the lemon juice once all has blended well. 7. Throw in asafoetida, mustard seeds, curry leaves and let them splutter. 8. Add in minced garlic, turmeric and coriander powder and saute. 9. Add the mashed potatoes now and mix everything thoroughly. 10. Add salt and chopped coriander leaves. The aloo mix is ready. 12. In a bowl add the besan and rice flour with some salt and turmeric. NOTE: The consistency of the batter should not be very flowy nor too thick. The consistency should resemble that of an idli batter. Now its time to fry the aloo bondas!! Yayyyyy!!! 14. Heat oil in pan for deep frying. 15. Dip each ball in the batter and ensure it well coats the aloo and slide it slowly in the pool of oil. 16. Keep the gas on the medium flame and fry until the bondas turn golden yellow. 17. Follow the steps for the remaining balls as well. 18. Cut the pav into halves. 19. In a pan, heat some butter and let it melt. 21. Get the pavs on a plate, apply the coriander chutney on the pav and sprinkle some dry garlic chutney, now place the aloo bonda and again sprinkle some more garlic powder on top of the aloo bonda and finally place the second half on the top. 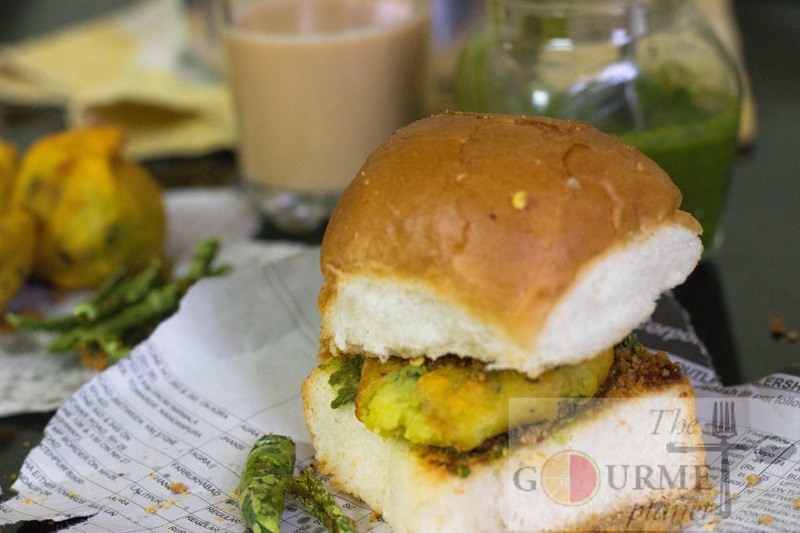 Your Vada Pav is now ready and if you wish for some more tongue tickling flavour, accompany it with some green chillies, slit length wise, de-seeded and deep fried. Further sprinkle some salt and amchoor powder and give its a toss. Have it with a hot cup of ginger tea and re-live those fond memories.